Dr. Natarajan received his medical degree from Stanley Medical College University of Madras. After his internship at Government Stanley Hospital, he did two years of post-doctoral training, and three years of teaching in India. He moved to the United States in 1971 and started his residency in internal medicine at Mercy Catholic Medical Center Thomas Fitzgerald Mercy Hospital and Brooklyn-Cumberland Medical Center. He went on to complete a fellowship in nephrology at St. Luke’s Hospital Center. In private practice since 1977, Dr. Natarajan joined The Westmed Medical Group in January 2004. 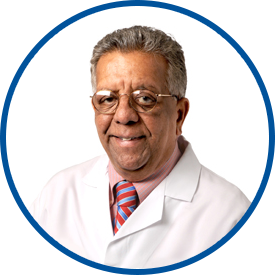 His current affiliation is with White Plains Hospital Center where he was the chief of nephrology for eight years. He was also medical director at a skilled nursing facility for twelve years and chief of nephrology at St. Barnabas Hospital and New York United Hospital Medical Center. Additionally, Dr. Natarajan is a clinical instructor in medicine with the Cornell University Weill Medical College. He is a member of the County Medical Society of New York and the Medical Society of New York State. Dr Sam Natarajan is an excellent doctor. He is comprehensive , and truly cares. I have recommended this care provider to a friend who needed a nephrologist. She has used the care provider for her mother and is completely satisfied with him, too. *Dr. Natarajan has expertise in areas beyond his specialty. He has been very good in analyzing the influences of one medication over others. I have been a patient of *Dr. Natarajan for more than 10 years, so he knows much circumstances very well. Dr Nat, is the best. He was very thorough and explained everything that I needed to know. *Dr. Nat is an excellent doctor. He is not my primary doctor, but he explains to me what my over all health concern is. He is also a very decent human being. That is the highest compliment I can give to anyone. I feel confident and lucky to been under the care of Dr. Natarajan. He is a great doctor. I recommend *Dr. Nat to everyone who asks for a doctor.